McAfee announced Monday its 2014 product line of consumer antivirus and security products for the PC platform. All are available for download or retail purchase starting today. 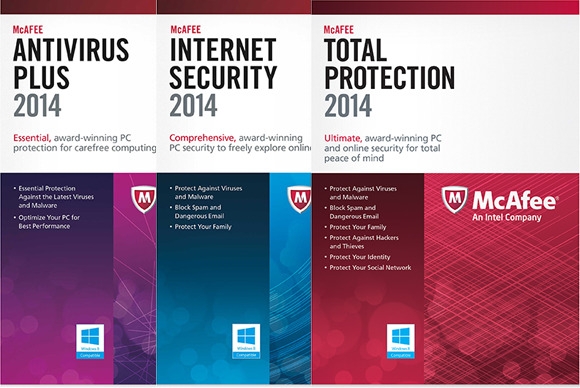 McAfee AntiVirus Plus 2014 is priced at $34.99 for one year of protection for one PC. McAfee Internet Security 2014 costs $55.99 for use on up to three computers, and McAfee Total Protection 2014 costs $89.99 for use on up to three computers. McAfee is also updating the LiveSafe cross-platform security product it announced in the spring. All of the upgraded products provide some basic protections. They all use McAfee's AM Core scanning engine to detect viruses, malware, Trojan horses, and their nefarious ilk in real time. McAfee claims to have faster scanning performance in AM Core as well, so it doesn’t hold up your computer's other operations. The new products also include McAfee Vulnerability Scanner to look for patches or updates to your installed programs. McAfee Shredder comes with all three products, supplying a tool that completely deletes files and makes them unrecoverable. To prevent hackers and other unwanted intrusions, the products include a two-way firewall and network security, plus a My Home Network viewer to check for freeloaders on your connection. McAfee SiteAdvisor also comes with all three, and tells you whether a site you’re about to visit is known to be safe, suspicious, or downright dangerous. Internet Security 2014 and Total Protection 2014 add parental controls including a usage report, activity monitoring, and site blocking. Both products also offer spam filtering. Total Protection 2014 adds file encryption and wireless network security. The latter can protect your passwords and data even if you’re using an open, public network. McAfee has long been a leader in antivirus and security software. Nevertheless, competition abounds, including capable freeware. The company says its AM Core malware scanning engine, introduced earlier this year, offers a competitive advantage because it can dynamically detect and fend off hostile software. Even simpler features like the McAfee Shredder seem like they'd be handy tools for routine PC housecleaning. We'll know more in a few months, when we embark upon our annual roundup of antivirus software.